The Baha SoftWear Pad is a small but important part* of the Baha Attract System. In fact it is integral to its success – as one of our engineers explained back in June. The small unassuming pad gently adjusts to the contours of the wearer’s skull to provide even pressure distribution and maximum sound transmission. The pad does need to be routinely changed, to get the most comfort out of the Baha Attract System. For most people this would be about once a month. But, everyone’s different and wearing time can vary due to amount of exercise, work environment, and hair and skin characteristics. Remove the pad from the Baha SP magnet by lifting and gripping the unglued portion, slowly releasing the pad from the magnet. Make sure that any remaining adhesive tape is completely removed from the magnet. Select a new pad and gently remove the cover sheet from the side where the soft material is slightly visible to expose the adhesive. 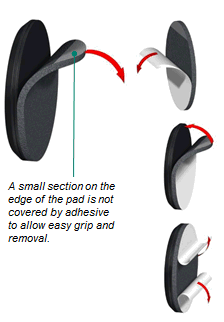 Attach the new pad to the magnet, making sure that the pad is centralised and covers the entire magnet surface. Finally, remove the remaining cover sheet. Imagine if you suddenly lost three of your five senses! This was a reality for Victor Makoski, USA. Removing an acoustic neuroma in 2007 left Victor totally deaf on his left side. He also lost his sense of smell and taste, but considers himself fortunate to not have been facially paralysed. Thanks to the advanced medical technologies of today, at least one of his senses could be restored. As he waited to be fitted with his sound processor, Victor found it a struggle not being able to hear. He was constantly tired, trying to make sense of the muffled sounds he couldn’t interpret. Gradually he withdrew from conversations and social activities. He would get frustrated because he couldn’t understand what was being said and had to ask his wife to repeat others. Getting his Baha sound processor was a relief. Having the Baha System has greatly enhanced his quality of life. Victor is a volunteer for Cochlear USA and also involved in the Acoustic Neuroma Association. Talking about the Baha solution is important to him. Read more: When is a Baha System right for me? Nine-year-old Camryn, Cape Town, South Africa, will be the country’s very first recipient of the Baha Attract System! The surgery was done in early March 2015, and the little girl is now waiting to get her bilateral Baha 4 Sound Processors fitted. The technique creates an invisible connection between the magnets embedded close to where her ears would have been and equally magnetised sound processors. 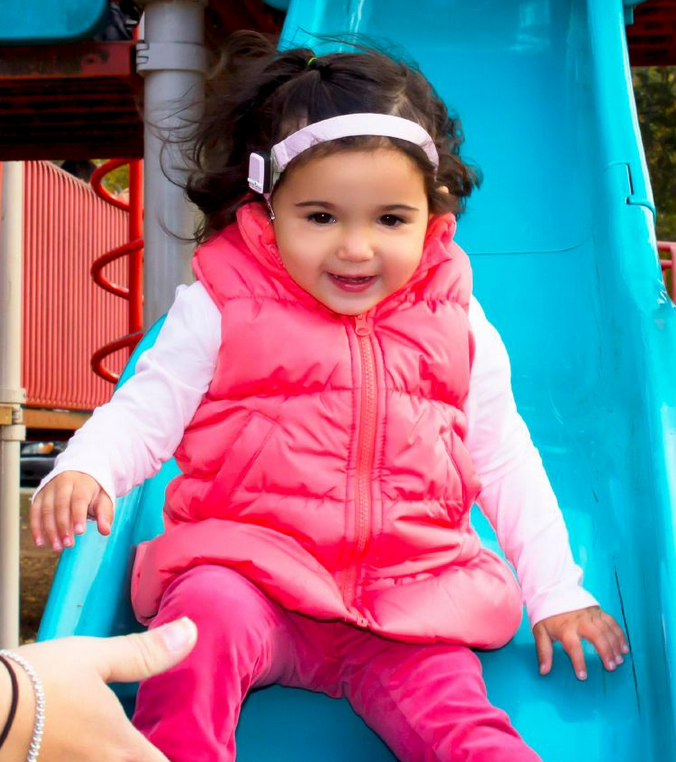 At birth, Camryn was diagnosed with Goldenhar syndrome – a rare congenital condition characterised by the incomplete development of the ear – and was certified as “profoundly deaf”. Camryn’s family was referred to ear, nose and throat specialist Dr Nathanie Naudè, who’d been in talks with Australian otolaryngologist Professor Robert Briggs about the new bilateral Baha technique. Briggs travelled to Cape Town to perform Camryn’s surgery, which was observed by more than 20 ENT specialists from across the country. People using the Baha 4 Sound Processor have been able to enjoy the wireless accessories for over a year and a half. We’ve previously shared how 4-year old Noel’s parents particularly liked using the Mini Microphone, and how Baha user Lee loves his Phone Clip! The wireless accessories are now available across Cochlear’s entire product range. This means that cochlear implant recipients using the Nucleus 6 Sound Processors also can benefit from them. 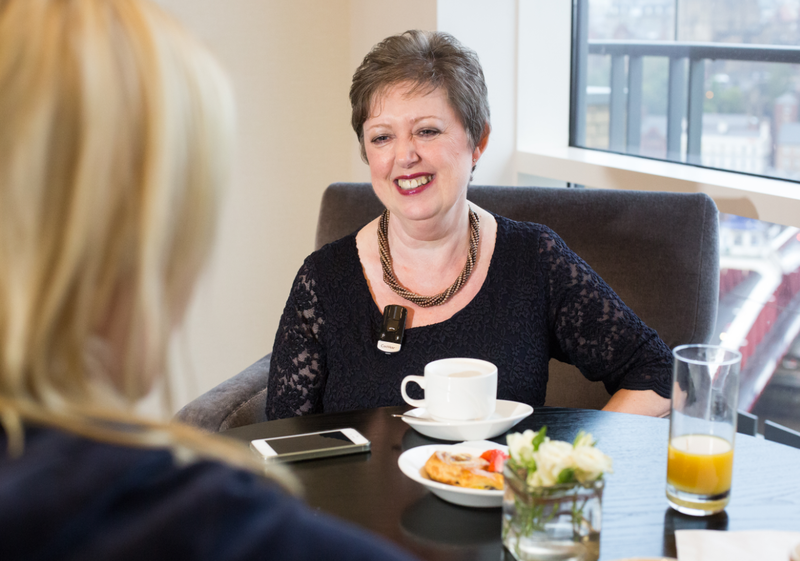 Cochlear is actually the first and only company that delivers this truly wireless freedom – without any need for cables or dongles worn around the neck. Read more about the wireless accessories here! When is a bone-anchored implant the right choice for my child—and why choose this option over traditional hearing aids or a cochlear implant? If your child has a hearing loss, it isn’t always easy to figure out which solution would be most beneficial for him or her. Is it a behind-the-ear hearing aid? A Baha solution? A cochlear implant? Well, first you need to know what type of hearing loss your child has. ASHA Leader’s editor-in-chief, Bridget Murray Law, talked to pediatric audiologist Jillian Kimberlain to get clear answers to all those questions. Read the article here. Do you have a question that wasn’t answered? Please use our own Ask the experts-function! Happy 10th birthday, Cochlear Bone Anchored Solutions! 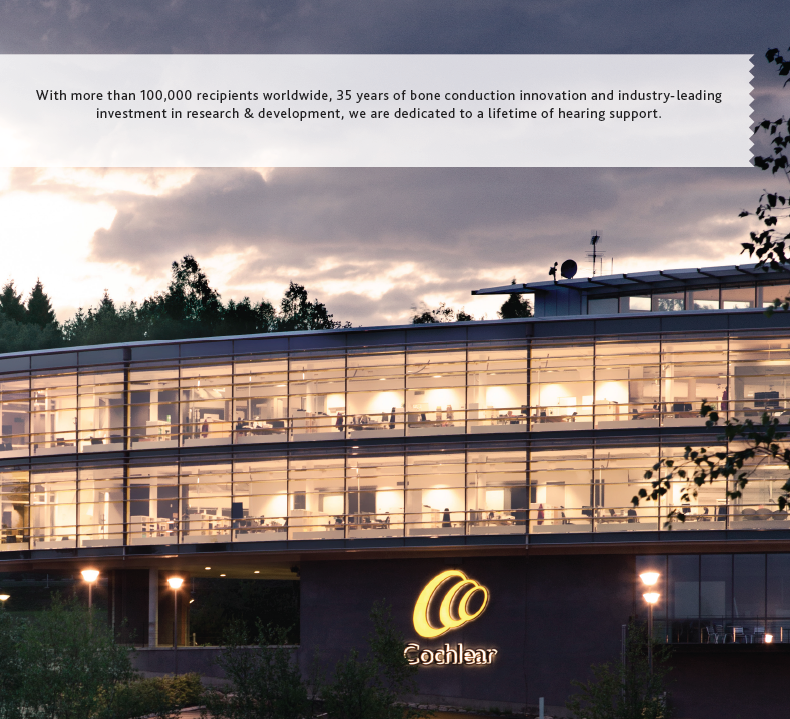 The month of March 2015 marks 10 years since Cochlear acquired the Swedish company Entific Medical AB. For a decade now, Cochlear Bone Anchored Solutions has been providing people all over the world with bone conduction hearing implants. It all started with the innovative idea to use the body’s natural ability to transfer sound. Entific Medical was founded in 1999 as a spin-off of the Swedish dental implant company Nobel Biocare. The new company focused on their innovative, implantable bone conduction hearing solution, the Baha System, which is also based on professor Brånemark’s discovery of osseointegration. 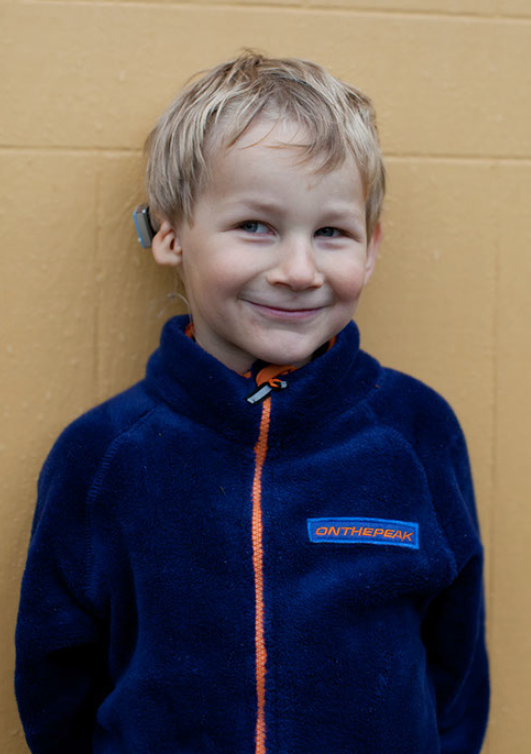 In 2005, Cochlear, the world’s leading cochlear implant company, recognised the potential of this innovation. 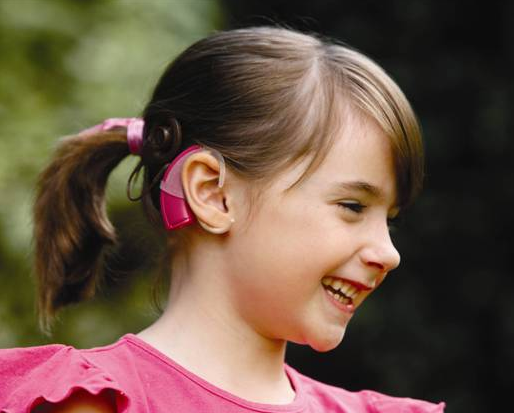 They acquired Entific and established a new company called Cochlear Bone Anchored Solutions. Cochlear was and is committed to bringing the latest cutting edge hearing technologies to the bone conduction implant field to help more people hear. In 2005, this meant they needed to invest fully in the company. Invest in the right people, the right prerequisites and the right place to do it. Within a year the company with about 60 employees had moved to a new, larger facility in Mölnlycke, outside Gothenburg on the Swedish west coast, with plenty of room for the manufacturing and R&D departments to grow. Today, more than 200 people work at Cochlear Bone Anchored Solutions – and the company has no plans to move. During these 10 years, these innovations have helped more people to hear than ever before – growing the number of people who use a Baha solution from 25,000 to more than 110,000. Living with hearing loss has more implications than just not being able to hear sounds. Social isolation is an important factor as many hearing impaired people shy away from social functions like going to a party or having dinner in busy restaurants because they can’t keep up with the conversations. For many, many Baha recipients, getting their bone conduction solution means not only restoring a sense – but restoring their life.